I know everyone likes to get the bad news over with first, so I’ll start with that. We found out on Friday that development resources are no longer being applied to Project Wonderland. The good news is that those of us who have worked so hard to bring this project to life still wholeheartedly believe in it. A core group of the Wonderland team intends to keep the project going. We will be pursuing both for-profit and not-for-profit options that will allow us to become a self-sustaining organization. Having anticipated this possible outcome, we already have some promising irons in the fire. As a first step in this next phase of the project, we will be releasing a Wonderland v0.5 Preview 3 release early next week. There is so much great momentum behind Wonderland. To our knowledge, there are currently three companies offering Wonderland-related products, and eight companies offering Wonderland world-building services. There are countless exciting university projects and a number of corporations that have seen the advantages of Wonderland over other platforms. We are seeing new people posting on the forums almost every day. Any concrete help you can give us would, of course, be welcome, but what we are asking for now is your moral support and your continued participation in our thriving community. Let’s stand together in our determination to keep this project moving forward. If you would like to contact me privately, please feel free to do so at nicoley @ dev.java.net. Last week I posted a new module to our (brand new!) Module Warehouse. It’s the Tooltip module. I originally wrote this module as an example of how to develop Cell Components (which are called Capabilities in the UI). I really do intend to write a tutorial around this example, but for now, I decided to upload it to the Warehouse. You can of course get the code too: it’s in the unstable/ section of the wonderland-modules project (see this tutorial for instructions on how to download this, and other, module source code). 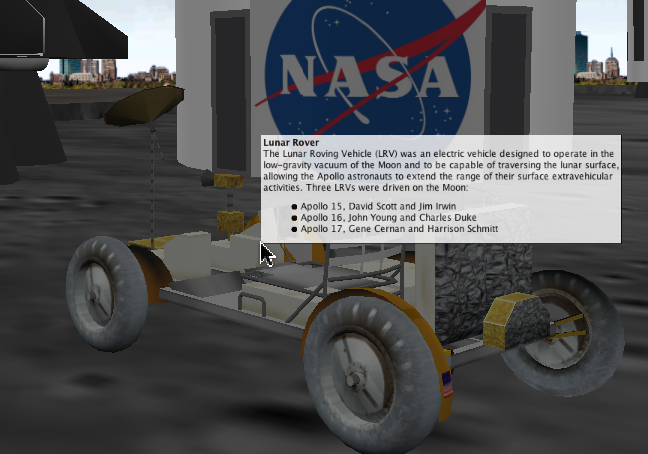 The Tooltip module displays a tooltip in the HUD when a user hovers over an Object in the world. 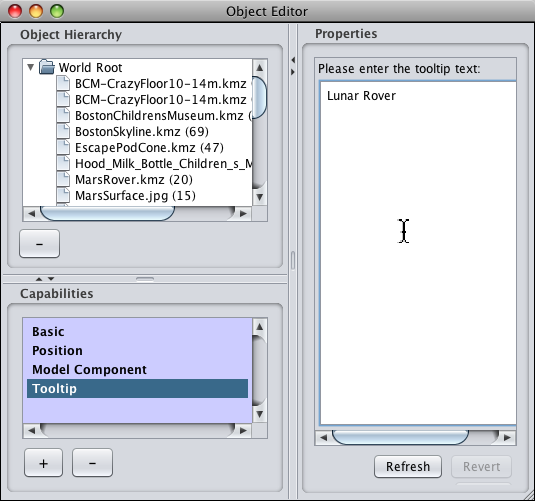 To add the Tooltip Capability, right-click on the Object and select Properties… from the context menu to bring up the Object Editor. 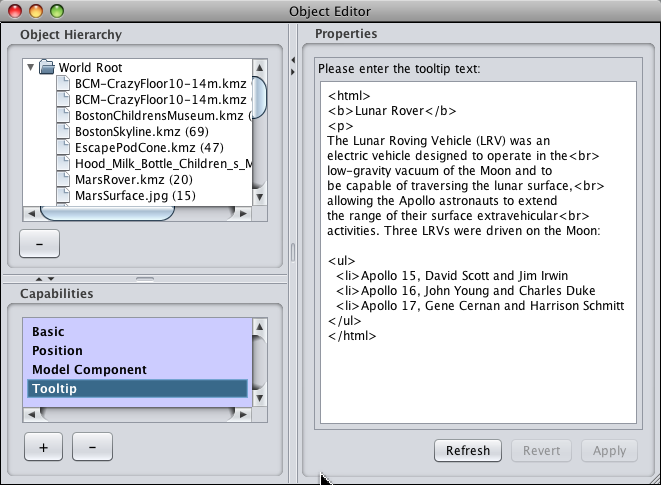 Then click the ‘+’ in the lower left-hand corner of the Object Editor (see picture below). Choose the Tooltip Capability from the dialog which appears and click OK. Then in the Object Editor, select Tooltip in the Capabilities list, enter the tooltip text on the right and click Apply. What’s cool about the Tooltip Capability (if I do say so myself), is you can enter HTML text as well. Just enclose your text in the <html>…</html> tags. Although the available support for HTML is limited, I’ve tested some common tags like <br> (to achieve multi-line tooltips), <b>, <table>, and even <img>. Today’s guest blog post is from Dr. Michael Gardner of the Digital Lifestyles Centre in the School of Computer Science & Electronic Engineering at the University of Essex in the UK. Dr. Gardner and his colleagues are one of the earliest adopters of Wonderland. You may recall his work on the MiRTLE project to create a mixed-reality teaching and learning environment. In today’s article, Dr. Gardner describes a new language learning project his team is working on in conjunction with their Department of Language and Linguistics. The SIMiLLE project at the University of Essex has just completed a formative evaluation of a virtual world designed to support second language (L2) learners. This is based on the use of the Project Wonderland platform. We are currently using Wonderland version 0.5, Preview2. The following video demonstrates the formative evaluation trial that was completed in December 2009. Here, the group of language learners log into the SIMiLLE virtual world and are split into pairs. Their task is to explore the world and organise a visit to London. 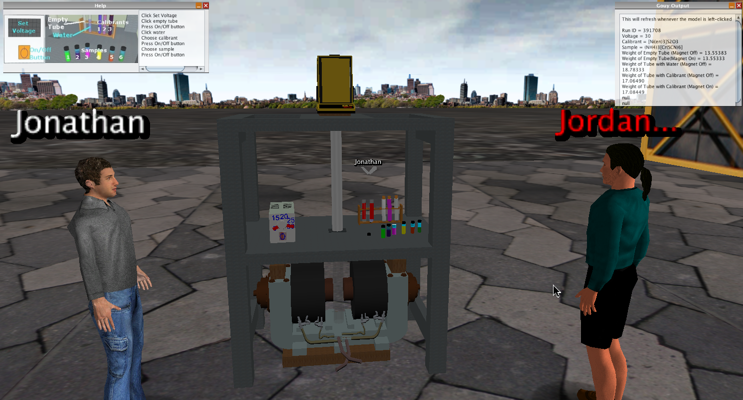 To do this they must visit various sites in the virtual world including a train station, and they can also make use of in-world tools such as shared web browser and notepads. The participants were five student volunteers recruited from the Department of Language and Linguistics at the University of Essex. All participants were speakers of English as a foreign language at upper intermediate level. The participants’ mother tongue included Arabic, Turkish, and Thai. All participants were computer literate, but none of them had any experience using 3D virtual world environments. The tasks were designed following a needs analysis procedure in consultation with the various stakeholders including language tutors and students of English as a foreign language. As a result, the role-play task was based on a real life scenario which students in the UK would probably encounter on a regular basis. As part of the evaluation we will be looking at the practicality and acceptability of the platform, the authenticity of the experience, the language learning potential, and the overall impact on the teaching and learning processes. In relation to the core objective of providing participants with opportunities for L2 development, the task did provide learners with opportunities to practise listening, speaking, reading and writing in the L2. They also engaged in negotiation of meaning; they had opportunities to pose questions, make requests, ask for information, clarification, and practice functions such as agreeing and disagreeing. The training documents were useful and helpful in enabling independent use of the world. SIMiLLE has the potential to help students learn about UK cultural aspects. The role-play task simulates real-life activities and can, therefore, prepare them for their stay in the UK. 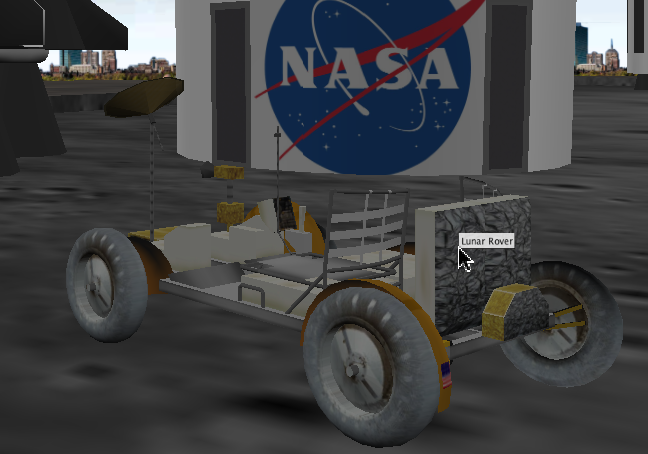 The environment has potential to simulate real places. They found the opportunity to use in-world applications such as sticky notes and Web browser motivating and potentially useful. They also considered the ‘sharing’ of those applications an asset to promote interaction. The use of avatars might help ‘shy’ students to interact more freely than in a face-to-face situations. The use of avatars can help individuals to ‘explore different identities’. The results from this formative stage are being used to refine the world and design a longer trial in conjunction with the International Academy at the University of Essex. The SIMiLLE project is funded by the Joint Information Systems Committee in the UK. Jonathan, Jordan, and I tried out the Wonderland version of the experiment and it took just a few minutes to run through the steps. We didn’t understand much about the chemistry involved, but we did get the gist of what was going on. Jon, of course, figured it all out first and used his telepointer to show Jordan and I how to step through the experiment and view the results. My one request for enhancement would be to network the application so that everyone in-world could see the experiment as it’s taking place. It’s exciting to see Wonderland being used to teach real science. Great contribution Craig! 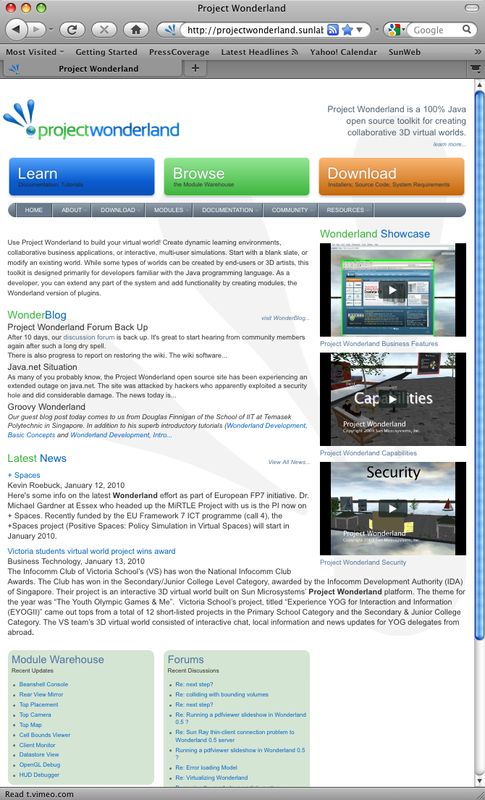 We are pleased to announce that we have unveiled a new Project Wonderland web site today. This web site, which you can access by navigating to ProjectWonderland.com, will now be the main portal for the project. Developer-focused content (e.g. wiki, forums, subversion) remains on the java.net open source developer site, but most other content has now been migrated to the new portal. Please spend a few minutes exploring the site to see some of the new content and learn how to find the pages you depend on. The most significant new feature is the Wonderland Module Warehouse, where you can download modules in their binary form that have been created either by the core team here at Sun or by the community. As you may know, modules (similar to “plugins” in other systems) add functionality to the core platform and can be easily installed using the Wonderland Server Admin web console. To get to the Module Warehouse, click on the large green “Browse” button on the home page. You’ll find that the Sun Labs core team has already seeded the Warehouse with a selection of modules. We invite you, members of the community, to use the Module Warehouse to share your custom extensions to Project Wonderland with others. On the Module Warehouse page, you can browse available modules by category, search for modules using keywords, or submit your own module (complete with instructions on how to do so). (As a note: We have compiled and tested all of the modules in the warehouse against the latest version of the software–aka the ‘trunk’. You can get the latest software in binary form from the nightly builds). We would be happy to hear your feedback on the new site and we look forward to seeing the Module Warehouse collection grow with your contributions. You are currently browsing the Wonderblog blog archives for January, 2010.